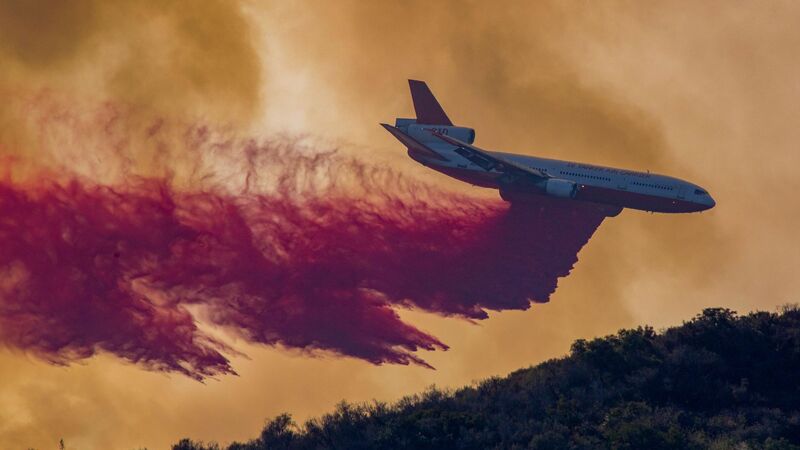 The 10 Tanker Air Carrier DC-10 jet drops fire retardant at the Holy Fire near Lake Elsinore, in Orange County, California, on August 7, 2018. Photo: DAVID MCNEW/AFP/Getty Images. Commerce Secretary Wilbur Ross ordered the National Marine Fisheries Service to "facilitate access to the water" needed to fight ongoing wildfires, rather than continue to provide some of it for protecting endangered species, such as Chinook salmon. Why it matters: The policy directive follows tweets President Trump sent that were met with confusion by California officials, including firefighters, who said the state has more than enough water to combat the blazes. The directive prioritizes firefighting needs above water allocation requirements under the Endangered Species Act, and other agreements established with the state of California and other federal agencies. "American lives and property are at stake and swift action is needed," Ross said in a statement. The big picture: The directive also implies that NOAA, which oversees NMFS, is rethinking its role in managing California's water to preserve endangered marine species, such as the Delta smelt and winter-run Chinook salmon. California's State Water Resources Control Board voted in July to use more of the state's water allocations for preserving fish populations — meaning farmers would get less than they were receiving. Republican state and federal lawmakers have opposed this plan. California is besieged by more than a dozen large wildfires, including the state's largest on record, which is equivalent to the size of Los Angeles, which is the sixth-largest city in the U.S. The water that NOAA helps manage is not firefighters' main resource for containing these blazes. Instead, they rely on building physical barriers, known as fire lines, to slow or stop fires from spreading. They also use fire retardants delivered from the air from large cargo planes and water drops that tap into lake and reservoir supplies. Though the state is in the midst of a drought, lake and reservoir levels are near average for this time of year. The Commerce Department's new directive states in part: "Public safety is the first priority. Consistent with the emergency consultation provisions under the ESA, Federal agencies may use any water as necessary to protect life and property in the affected areas. Based on this directive, NOAA will facilitate the use of water for this emergency. Going forward, the Department and NOAA are committed to finding new solutions to address threatened and endangered species in the context of the challenging water management situation in California." The Trump administration is pursuing separate actions through the Interior Department and Congress to enact broad changes to the Endangered Species Act. Environmental groups view the new policy as a way to use the fires to benefit agricultural interests that are seeking more water for irrigation, and limit the reach of the Endangered Species Act. “Secretary Ross’s directive is nothing more than a smokescreen designed to weaken these protections," said Kate Poole, water program director for the NRDC, in a statement. Editor's Note: This article has been updated to include a statement from NRDC.